I absolutely love the trends this Spring. 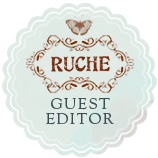 As you may remember, I posted some of my newest loves from Ruche, which has become my hot spot for daydreams. My beloved husband surprised me a few weeks ago by snatching up two of my favorites that were about to be sold out! I'm absolutely in love with this dress. I'm also so happy that I snatched up this pair of shoes from Target, which were on sale for $9 over Christmas break! While it's starting to warm up around here, it was still a bit chilly in the mornings and evenings so I paired my dress and shoes with some brown tights. Mint is probably my favorite thing about the trends this Spring. Ruche has capitalized on the Mint trend, and has some of the most adorable things. I love the color combination of this floral print! All that to say, I'm absolutely thrilled I've found a boutique that I love. It has kind of re-inspired me to invest more in my wardrobe, and get the most out of what I already have! I feel like it's really easy to fall into a rhythm of clothing laziness. After getting married and moving away, and settling into a rather stationary desk job, I haven't been putting a lot of effort into what I throw on in the morning. I usually gravitate to the same comfy pants and baggy cardigan. Sad, I know. They're from one of my favorite jewelry shops, Chelsea Girl Designs on etsy. Her earrings are to die for. So vibrant and unique. While I love everything I've ever gotten from her, these pink droplet earrings are by far my favorite. 15% of all sale items with "SaleSale15" as the coupon code! Caitlin, you are adorable! Thank you so much for sharing my earrings with your beautiful outfit! Can you clone that wonderful husband of yours? I am so grateful for your continued support! Customers like you are what keep me creating! Get in my Belly: Washington D.C.